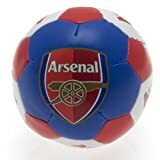 The 4 Inch Mini Soft Training Ball is made with 100% Polyester stuffing and has a soft vinyl cover, it features in famous club colours and has printed club crests and logos. The ball can be used for practising your flicks tricks at home. The ball is supplied in a blister pack and makes a great gift or souvenir for any Supporter. The 4 Inch Mini Soft Ball is an official product and is produced under licence for the respective Football Club.